In my Missouri town my furry hat and leather gloves are needed when I get out and about this week. Winter’s chill is here to stay for a few months. It came before the winter solstice and Christmas this year. A fire in a wood stove or fireplace is welcomed, but the chillest of December days seem to warm up with good food, drink, and fellowship. Holiday celebrations are underway. The inner chef in me loves the holidays. With last week’s office party I made a traditional tiramisu to go with the Italian luncheon of pasta con broccoli and lettuce salad. For the extended family gathering last weekend, I prepared a 11-lb ham with a Bavarian-style glaze of brandy, brown sugar, and Dijon mustard with each family member pitching in with a homemade side dish or dessert. A cheese platter like this photo from Cabot will be designed for another celebration, with spirits served at each gathering. I want to connect with those I love, and those I need to love more … warming spirits and hearts. Tis the season, reason for the season. Hibernation will come later. Curling under a blanket with a book, writing, and dreaming. “Ham and green beans in my evening rice, with a glass of that good blackcherry wine on the side. Hibernation is a fine art!” ~David J. Beard. This time of year the work day is eased into analyzing aggregate reports, research on other wellness programs, event planning, and networking for the year. I like the slower pace which last about 4 – 6 weeks in December into January. It is when I finally have the employee wellness events booked on the calendar. Yes, forecasting at least 9 months ahead. It is much like a teacher and his/hers curriculum planning during the summer for the next school year. It will be another busy year at St. Louis County, the busyness starting next week with several meetings and a health fair. Much the same as with the farmer, his/hers planning for the spring and autumn crops is done during the frigid cold months. My father was a tree farmer, and the winter was filled with book work and ordering of a new stock of plant liners. My siblings and I would plant 100’s of plant saplings through the spring; lots of hoeing, weeding, and watering in the summer; and autumn a few more plantings and prepping the pines for the holiday harvest. I cannot say Deanna Greens And Garden Art has quite the planning of a full-time farmer. The greenhouse is a hobby of Dean and I’s while we work full-time. Our part-time organic herb and vegetable growing is fragrantly and deliciously rewarding while the beautiful geranium blossoms are pleasing to the eyes. During Dean and I’s Nashville mini-vacation in December, we toured the Belle Meade Plantation. Each room in the historic house was festively decorated with period Christmas ware, with the kitchen set in the 20’s. The kitchen is my favorite room. And there set a terra cotta pot of red geraniums in the windowsill, again another favorite of mine. A vintage flower. And red geraniums aflame upon my window sill. And low above my green-sweet hill the gypsy wind-clouds pass. Some days the pets as well as neighborhood squirrels and birds watch us as if we are their entertainment. Most other days, it is the reverse. The household and outside critters are our entertainment. Our pets, Midnight, Celine, Jonas, and Pennylane will greet us at the front door after a long day at work. The dog with a wagging tail and panting smile, and the feline friends with purrs and nudges to be petted. The birds and squirrels gather at the dogwood tree to feed on seeds at the feeder or underneath where the seed remnants lie on the leaf-mulched earth. When asked what my new year’s resolution is, the word is “repurpose”. Repurpose items already obtained. Rejuvenate, repair, renovate, recycle, all to mean the same as repurpose. Utilize an item for a purpose or meaning once again. To go with this year’s theme of “repurpose”, this weekend I had purposed to wash all the stuffed animals and characters that have residence in our home. We have quite the collection of teddies, rabbits, chicks, dolls, doggies, and even a Tazmanian devil from my children and grandchildren. These toys provded hours of entertainment and occupied a hammock hung in the back bedroom or sit on the bay window seat. One basket situated in the living room was bed to some favorites, ready at a moment’s notice to be gathered into the arms of a visiting child. Since my daughter moved in, more space is needed in the back bedroom. 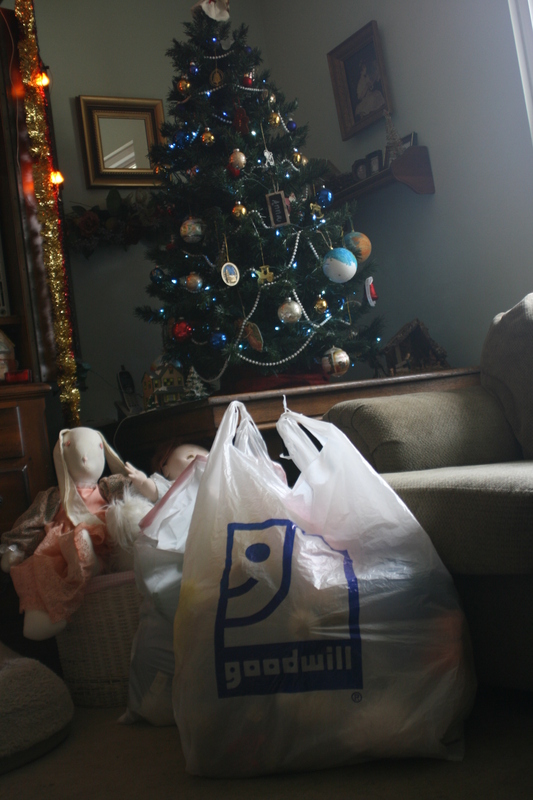 We placed these critters in plastic bags until after the holiday madness simmered down. To the local laudromat we went with 3 large plastic bags, filled 2 front loading machines. Dean and I watched as the soapy faces plastered against the door windows, as if they muttered “help!” from their foaming mouths. After the wash cycle we dried the freshly washed critters for just a few minutes in a gigantic-sized dryer. 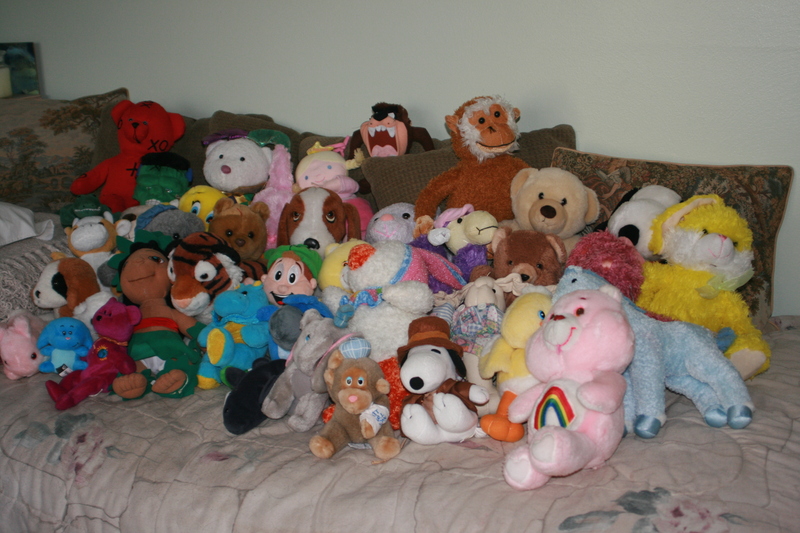 We brought home the damp stuffed animals, lined them on the trundle bed to air dry. Dean captured this photo of their greeting smiles. A bath always makes you feel better! Later we turned the critters on their heads, with their backsides up to air dry. We waited for our Labrador, Midnight to land himself atop the stuffed critters as the trundle bed is one of his favorite spots to nap. But the stuffed critters remained undisturbed. Maybe there were too many of the critters, slightly overwhelming? We think so. Two of these toys date back to 32 years ago, my oldest daughter’s 1st Christmas teddy and 1st birthday Hush Puppy. The Care Bear with a band-aid on his leg was given to my oldest when she recovered from appendicitis at age 5. Another doggy belonged to my other daughter, and a teddy with a blue beret belonged to my artsy son. Others are a handmade rabbit and doll from a special grandmother. So the other purpose for the communal bath and animal reunion was to donate the less familar clean, germ-free critters to Goodwill. Some other children to love on their cuteness, softness. Tote to a tea party, wagon ride, or bedtime. We filled 2 bags to repurpose. And the other special animals and dolls sit in the living room inside the white wicker basket with a pink-gingham cloth lining. These await another child’s love, maybe more grandbabies? My best Christmas was the year my son, Ben was born. He came to this earth the Saturday after Thanksgiving 22 years ago. Ben was my “oops baby”. Not planned for, but dearly wanted and loved. My son acquired pneumonia immediately after birth from a strep B virus I carried, which I did not know I had. A scary time, but Ben quickly recovered with hospital care his first 10 days. Within a few days I had my energy and strength back, made daily visits to see my son sometimes twice a day to cuddle and nurse. I knew I would not have the energy or time to enter into the stores those first 3 or 4 weeks after my son’s birth. So I planned ahead, and had all the Christmas shopping completed before Thanksgiving. In those 28 days after Ben’s birth leading to Christmas I adjusted my sleep to his feeding and napping schedule. It had been 9 years before that when my middle child was a baby. I worked from home as the bookkeeper for our church, and was graciously given the month off from those responsibilities. Instead, I meandered into the advent season, wrapped gifts between naps and feedings. The silver pine was decorated one evening after my daughters’ homework was completed. Cookie baking with my mother during the Saturday just before Christmas was done with ease. I meditated on scripture and sang “O Holy Night” with feeling. Joy. Celebrated the miracle of my baby. It was a simply sacred season. Since that year of 1992, I have yet to have all my holiday shopping completed by Thanksgiving. For many years, I am well into Christmas Eve almost into the wee hours of Christmas Day wrapping gifts to put under the tree. A dizzy daze the Christmas season can be. And how did it get that way? Too many parties, gifts, food, family, and expectations. Advent is lost, sometimes found again in those wee hours of Christmas Day before the pitter-patter of children’s feet as they hit the floor running to see what presents have been placed under the glowing tree. “Advent” means “coming”. Jesus, the King and our Messiah is coming. I pray you and I have a simply sacred season this holiday. Less shopping, baking, eating, and doing. Just be in His Presence. Come, Jesus. God’s gift.